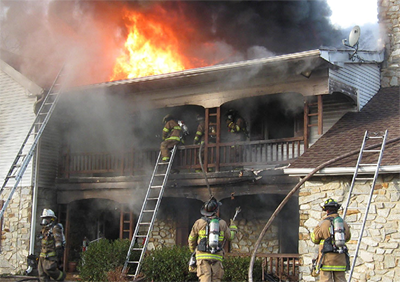 For first responder organizations such as the Anne Arundel County Fire Department (AACoFD) in Maryland, Computer-Aided Dispatch (CAD) is quickly becoming an essential part of timely response during emergencies. However, CAD is completely dependent on always-on network uptime in vehicles guaranteeing accurate, real-time vehicle location data. AACoFD deployed Cradlepoint’s cloud-managed, all-in-one in-vehicle solutions throughout its fleet, providing the connection reliability, data security, remote visibility and management capabilities, and interoperability necessary to cost-effectively use emerging technologies that help save lives. AACoFD employs roughly 900 career fire-fighters and around 700 volunteers who serve the more than 500,000 residents of Anne Arundel County. The county, which neighbors Washington, D.C., is one of the most populated jurisdictions in the U.S.—ranked 114 out of 3,141 counties. The fire department has 21 Advanced Life Support (ALS) units, 9 Basic Life Support (BLS) units, 28 engine companies, 3 quint companies, 9 ladder companies, and 5 squad companies. It also provides mutual aid services with the Baltimore Washington International Thurgood Marshall Airport, City of Baltimore, Baltimore County, Calvert County, City of Annapolis, Prince George’s County, Queen Anne’s County on the Eastern Shore, the U.S. Army Post Fort George G. Meade, and the U.S. Naval Academy. “We want to use the best and most current technology to provide services to our citizens in a manner that is both cost-effective and efficient to the fire department and to the taxpayers,” said AACoFD Battalion Chief Robert Howarth. When AACoFD decided to implement a new CAD system, it also made a commitment to begin using Automatic Vehicle Location (AVL) dispatching. Until that time, the department had been dispatching fire apparatus to emergencies based on the proximity of fire stations rather than where specific vehicles were located. “We wanted to make sure we could find the location of our vehicles in relation to the incident that was being dispatched so that we could send the closest vehicle with the shortest response time for each emergency,” said Howarth. The county IT team was excited about the new capabilities, but they recognized it would only be possible with reliable 4G LTE connectivity that would ensure accurate, real-time GPS information. They sought an all-in-one solution that would provide always-on WAN access and security of sensitive information. Additionally, they wanted a solution that could easily be deployed, monitored, and managed remotely through a single pane of glass. The county already had been successfully using Cradlepoint’s 4G LTE solutions to connect portable cameras, as well as fixed sites in rural areas that don’t have access to wired lines and Internet service providers. To extend constant and highly secure connectivity to nearly 200 fire vehicles, AACoFD selected Cradlepoint’s in-vehicle routers, delivered through the NetCloud platform. With always-on WAN access, AACoFD can rely on its GPS-based vehicle location data and CAD system to help improve public safety. A high-performance 4G LTE solution with constant connectivity gives AACoFD the confidence to rely on real-time vehicle location information that allows their CAD system to choose and send fire apparatus and personnel to the emergencies that are nearest their current location. The Cradlepoint routers send the GPS coordinates to the CAD system every 3 seconds. When an incident arises, the CAD can see where the closest vehicles are. “When an emergency occurs, having the appropriate resource there in the fastest available time is exactly what our mission is,” said Howarth. During extreme weather conditions, AVL services also enable personnel at headquarters to find firefighters who are unaccounted for. Vehicles can be located via GPS coordinates, which can help keep first responders safe. From deployment to troubleshooting, the AACoFD IT team has experienced the broad benefits of NetCloud Manager (NCM). First, the platform made last-minute configuration adjustments to the router—which arrived preconfigured—very easy. “NetCloud Manager has been extremely helpful for us in deploying routers as soon as possible,” said Emily Meadows, the public safety portfolio manager for AACoFD. Beyond deployment, NCM has given county IT and CAD managers clear and expansive visibility into network status and data. Anyone with administrator access can log in from anywhere to view the status of routers and push out NetCloud OS updates, security updates, and custom apps remotely. “The ability to access NetCloud Manager from any location really expanded the support capabilities that our team could provide. Just that visibility alone is something we don’t get with a lot of other spaces within our IT infrastructure," said Meadows. NCM is so intuitive that the county is comfortable giving certain fire department personnel access to the platform so they can log in and, when feasible, do their own troubleshooting without involving IT. “We’re eliminating bottlenecks in the process by allowing our end users to have access to the cloud management tool,” said Meadows. Cradlepoint’s enterprise-grade solutions with built-in stateful, multi-zone firewalls are important for helping AACoFD protect the sensitive patient health information and vehicle location data used by the county during emergency response. Local first responder agencies such as the Annapolis City Fire Department that work closely with AACoFD in emergency response have been able to purchase their own Cradlepoint routers and easily integrate their communications. The county dispatches the City of Annapolis Fire Department through its own CAD system, so managing both organizations’ routers through NetCloud Manager made sense and was easy. “The level of interoperability we have with the Annapolis City Fire Department would have been very problematic, if not impossible, without Cradlepoint’s cloud-managed solutions,” said Meadows. When the county’s IT team has questions, they call Cradlepoint’s 24x7 support team for simple access to industry-leading expertise. “Using Cradlepoint’s Support Service is an incredibly easy process,” said Meadows. With more than 2,000 agency customers, Cradlepoint has public safety and first responder deployments in every U.S. state, including 25 of the largest cities, providing mission-critical data networks for vehicles, mobile command centers, surveillance cameras, and incident response teams, as well as secure connectivity for in-vehicle, on-scene, and body-worn devices. Want to know more about Cradlepoint Network Solutions?